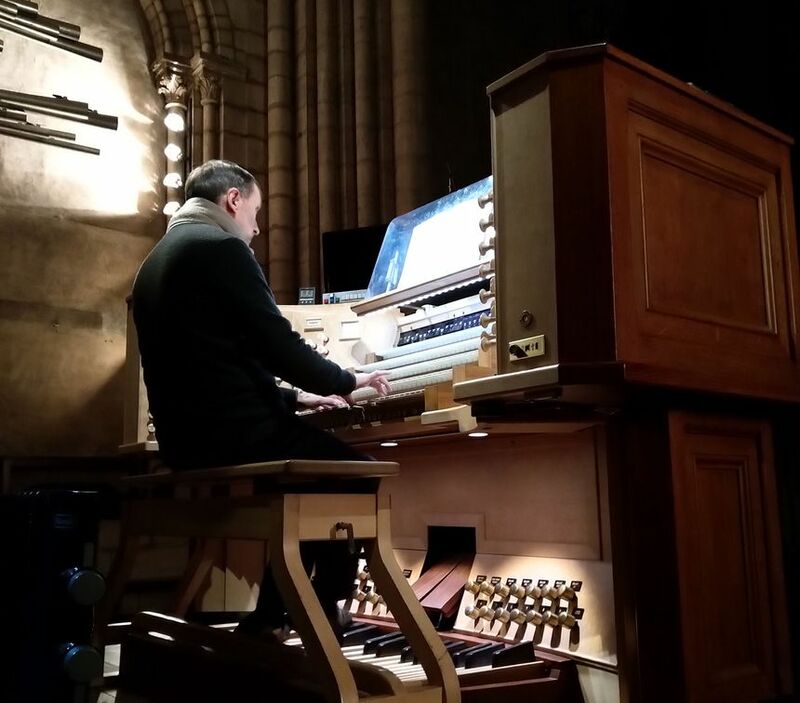 An interview from January 2019 with Olivier Latry, head organist at the Notre-Dame Cathedral in Paris since 1985, only months before the devastating fire of 15 April 2019. The organist had decided to record the works of J. S. Bach on the cathedral's legendary organ for his next album. The Notre-Dame Cathedral in Paris is empty, completely silent, and plunged into darkness. Only one light can be seen, 16 meters up from the ground, lighting the monument's organ console. This is home for Olivier Latry. Head organist, or "titulaire des orgues", at the Notre-Dame Cathedral in Paris since 1985, he knows intimately both the impressive monument and the majestic instrument, entirely renovated in 1868 by Aristide Cavaillé-Coll. This evening, on 8 January 2019, Latry recorded four works for his upcoming album Bach to the future. In total, three whole evenings were required to record all the works. A graveyard shift for the organist since, located in the centre of Paris, the cathedral is at the mercy of the city's everyday sounds: "We can't start too early, so everything that can be played loudly is recorded early on in the sessions, and then around midnight or 1am we record the quieter pieces when it is totally silent outside", explains the organist. I wanted to imagine how Bach's music could live for centuries beyond all musicological contingencies. To record the works of Bach on the grand organ of Notre-Dame in Paris has been a dream in the making Olivier Latry for over thirty years. And it is an ambitious project: "The organ is of symphonic proportions, it is gigantic", says the organist. "Certainly nothing to be compared with the various instruments upon which Bach may have performed". The instruments are not to be compared since the project is "far from any kind of historically-informed performance", the organist was keen to add, clearly aware of the provocative nature of his latest project. _"_I wanted to imagine how Bach's music could live for centuries beyond all musicological contingencies used in my previous albums", explains the organist". "My aim was to create something completely new, and to breathe new life into the instrument and the music", he adds. This recording is therefore an opportunity for the organist to "fill the cathedral's sound space with the organ". In order to do so, Latry selected the greatest and most suitable works for Notre-Dame, but not without some difficulty: "The problem is not only the organ but also the hall's seven-second echo, so we can't just perform anything we want. Certain works would be unsuitable, including works with too many details such as chamber music or organ trios". Olivier Latry therefore chose works for mass, occasionally polyphonic, in which case he spread out the voices over several keyboards: "Just as well, there are five here! Each voice will be heard with a unique timbre, which will help us clarify the musical dialogue". This is where another person essential to the project comes in: the sound engineer. For this recording, Latry called upon François Eckert who set up microphones throughout the cathedral: "The biggest challenge was placing the microphones exactly where we wanted, since this was not always possible, unlike in a small church", explains the engineer. "In Notre-Dame it would be almost impossible if there were not already a system of pulleys already installed that come down from the ceiling all the way to the floor." A well-established system that still posed several problems: "When we have a suspended system such as this, we are not always able to place the microphones exactly where we wish, unlike with a stand". François Eckert also placed microphones directly beside the organ, microphones that "allow to record certain precise sounds", since the cathedral has one particular feature: the organ is very high in relation to the public (approximately 16 metres from the ground), giving the sound "an overall distant effect", says Eckert. "I told myself that we are recording an album in which we would hear the organ as if it were played in a more appropriate environment". Certain microphones were even placed in the instrument itself. "Tonight we're recording a work in which we hear soft and distant bells, so I will place a microphone near the bells to see if we can bring them out in the post-production mixing", explains Eckert. It is just after 8pm, everything is ready for the recording to begin. A young organ tuner, Itaru Sekigushi, has just spent a while in the instrument to re-tune certain stops with the help of Olivier Latry. The three men will now spend several hours in the deserted cathedral, surrounded by the sound of the works of Bach performed on the grand organ. Bliss.